James Johnson, a pianist and composer who was also known as a Harlem Stride pianist, collaborated with author and producer Flournoy Miller to produce the Sugar Hill revue in 1931 for this song. 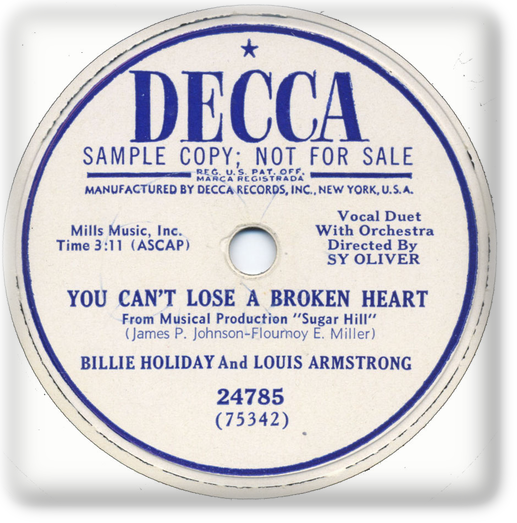 Louis Armstrong and Billie Holiday recorded “You Can’t Lose A Broken Heart” as a duet with Sy Oliver and His Orchestra in 1949 on the Decca label. 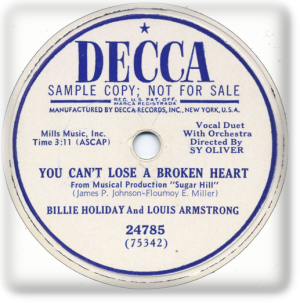 “You Can’t Lose A Broken Heart,” a duet with k.d. lang, was recorded in March 2002 and released that same year on Tony Bennett & k.d. lang: A Wonderful World. Vocal arrangements were by Rob Mathes. The album was orchestrated and conducted by Peter Matz, with musical direction and arrangements by Lee Musiker.